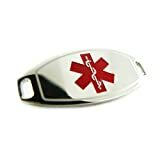 Emerg Alert Medical Alert Emergency ID Bracelet and Wallet Card - "Alzheimer's Disease"
Round silver/gray glass beads stretch bracelet with dangling Silver Ribbon charm. Meaures 8" before stretch begins - stretchy to fil everyone! Order 12 and get free mini display! 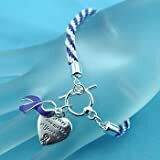 Comes carded with verse: A symbol of your support to inspire Hope and courage in those who suffer From Diabetes and their Families Printed on back of card: "Every time a "Just Cause" bracelet is purchased, A portion of the proceeds are contributed to Diabetes treatment and research. 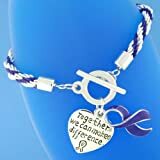 May it serve as a symbol of your ongoing support of Diabetes." Just Cause Bracelet line also available for Aids, Altzheimers, Autism & Breast Cancer Awareness.